3) generate additional tax revenue from the very wealthy, he was willing to adjust the formula used to calculate the cost of living increases for Social Security recipients. The objective of this move will result in a reduction of benefits to Social Security recipients estimated by the President himself, to be approximately $130 billion dollars over the next decade. The end result is, as the cost of living increases over the coming years, retired seniors would get less of an increase in money from the federal government due to the adjustment of the formula which tracks the cost of living. It would be, if the Obama administration had its way, a graduated decrease in the cost of living allowance the federal government normally would pay seniors. The best way to look at this is, it will result in a cut in the paycheck of future recipients once the new formula goes into effect. Informed sources state, “Someone who started collecting the average Social Security benefit for a retired worker in 1999 would receive $12,972 in 2012. But let’s say the Social Security Administration had already been using the chained CPI formula — that person would get only $12,336 in 2012. That’s nearly 5% less.” However, in administering this cut in the increase of the rate of the cost of living formula, Mr. Obama and his administration are behaving as if the Social Security Trust Fund is intact and as a benefits program exists in its original state. You hear politicians say repeatedly that the Social Security program is not bankrupt. They say it has enough funds to pay out full benefits until the year of 2033. This suggests, as the politicians who make that claim want you to think, the program looks much like it did when it was originally established. Every now and again, you hear other politicians say Social Security is a “Ponzi scheme,” and the American public has been lied to, about its solvency. The definition of a “Ponzi scheme” is a fraudulent business operation which uses new money coming into the operation to pay off old, current, or more mature investors. The fraud falls apart when the ability to attract new money ceases. With this definition in mind, it would mean current and old Social Security benefit recipients are being paid directly from the payroll taxes of American workers, which is in this example, “the new money,” rather than from the investment reserves of the fund. Who should you believe, people like Mr. Obama and his administration or the Republicans who want to scuttle the Social Security program? You should read the facts and draw your own conclusion. Here are the facts. 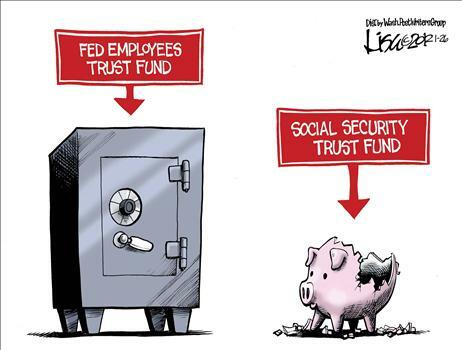 There is not a vault or an account somewhere in Washington D. C. which has in it Social Security funds. Certainly, there is no account which has the $2.5 to $2.7 trillion dollars politicians often refer to when they say the Social Security Trust Fund is not broke and can pay benefits out to 2033. No such animal exists! In 1983, then Republican President Ronald Reagan and the Democratic Party House Speaker Tip O’Neill responded to the need to “fix” the Social Security program which they said was in deep trouble due to the impending retirement of the baby boomers. They surmised the current state of the fund would not support the retirement of the baby boomers. Their answer was to form a committee headed by Alan Greenspan to come up with a solution. The solution was to substantially increase the payroll tax and extend or put off the time when benefits could be paid-out from the Social Security Trust Fund. This was all done to meet the demands of the baby boomers who would after the fix, start pulling down full retirement benefits from the trust fund in 2012. There was nothing wrong with this fix as it proved to be the right approach. After all, approximately 30 years of accumulated capital reserves earning a competitive rate of interest should be enough money, they reasoned, to make the fund sound. However, it is what happened to the billions of dollars of “increased payroll taxes” when those taxes started rolling into the treasury, is what caused the undoing of the solution. Instead of President Reagan and his administration taking those increased taxes and transferring them to the account of the Social Security Trust Fund, where they would have drawn interest in preparation of the retirement of the baby boomers, they used those payroll taxes for other activities. It is highly possible because the Social Security payroll taxes were co-mingled with the general revenue of the federal budget, the payroll taxes facilitated tax cuts to the very wealthiest of Americans in 1986. Without affecting or causing disruptions in other government programs such as defense spending or welfare, Mr. Reagan and his administration were able to use what they saw as “new money” to fund their pet projects. This was all done without the knowledge of the American public. Nevertheless, it was widely known this was happening among Washington politicians and insiders. Each president after President Reagan used the increased payroll taxes in one way or another for their own projects. President H. W. Bush used them to fund the government. Again because the increased payroll taxes were a part of the general revenue of the federal budget, President Clinton likely used the increased Social Security payroll taxes to balance the federal budget. According to Dr. Allen Smith who wrote “The Big Lie” (http://www.thebiglie.net ), it was the Social Security payroll taxes that furnished the so called “surplus” of the federal budget declared by President Clinton when he left office. President Clinton declared there was a “surplus” in the federal budget when there was none! Had the increased Social Security payroll taxes been extracted from his federal budget, it would have shown a deficit. Nevertheless, this prompted incoming President George Bush to campaign on a promise to give the “so call surplus” back to the people in the form of two huge tax cuts with most of those cuts going to the wealthiest of Americans. President Bush also plunged the country into two wars using deficit spending to pay for them. During the 2008 downturn, which was the greatest economic downturn this country had seen since the Great Depression, government deficit spending expanded exponentially sweeping up the Social Security payroll tax into the regular operating budget of the federal government. As a result, what is left of the $2.5 to $2.7 trillion dollars that is supposedly in the treasury of the United States, is a “worthless IOU” from the federal government. There is no reserve for the federal government to pull on to make Social Security benefit payments! You say, so what, with the full taxing power of the federal government, the federal government can afford to pay the benefits of retiring baby boomers from the current account of the federal budget. However, this is where the rubber meets the road, as they say! Each day that bill increases as 10,000 baby boomers will retire every day over the next 18 years! It is estimated the current payroll tax being collected will be insufficient come 2015 to pay the benefits of currently retiring baby boomers. The fund, as a result, will run a deficit. By 2020 the federal government, it is estimated, will have to come up with $101 billion dollars to pay the difference between the amount collected from the payroll tax and the cost of benefits to retiring baby boomers. By 2035, the federal government in addition to other expenditures will have to come up with over a half trillion dollars, or an estimated $622 billion dollars, to cover the difference between what is collected in payroll taxes and the expenses of retiring baby boomers! You see, there is no reserve for the federal government to pull upon! It was spent! Now, do you understand why Mr. Obama and his administration are attempting to make cuts to Social Security and will continue to do so, as they break the promise made to the American people of being good stewards of the Social Security Trust Fund? Any time the federal government can reduce benefits to Social Security recipients, it reduces its obligation to pay that “looming increased bill” in the outer years. We, as a people deserve better from our elected officials who should be working in our best interest! One could say, what happened to our social security payroll taxes was a federal government sanctioned redistribution of income from workers to the wealthy. Money was literally taken from wage earners through taxes ( payroll tax) and given to the wealthy via tax cuts. ( Additional information regarding the Social Security Trust Fund Fraud can be found at this site ( http://www.thebiglie.net ). Do yourself a favor. Follow up on the facts in the book as I did. It will give you specific dates, names, times and quotes. Google, “Is there any money in the Social Security Trust Fund” and get the surprise of a lifetime. Become informed! Mr. Obama was not doing any of us a favor by cutting our Social Security benefits! content as you did, the web can be a lot more useful than ever before.